Gusty wind is expected to develop in the deserts of San Diego County on Tuesday afternoon, making driving difficult along Interstate 8 in the back country. 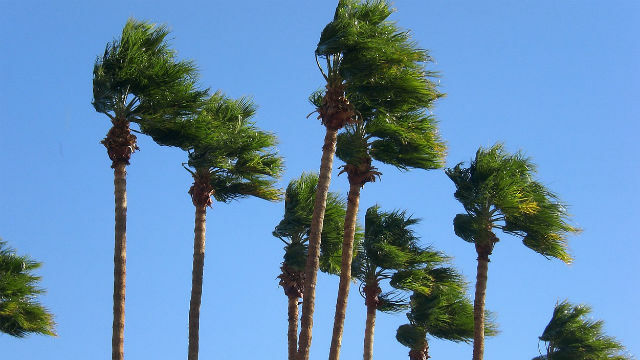 A National Weather Service wind advisory for the deserts is set to take effect at 2 p.m. and extend until 8 a.m. Wednesday. West winds of 20 to 30 miles per hour are forecast for the advisory period, along with gusts that could reach 50 mph. Weather service meteorologists attributed the winds to a weak trough moving across the region. The winds will start to subside Wednesday morning. The wind could cause hazardous driving conditions, especially along Interstate 8, the weather service said. Visibility along some desert roadways could be reduced by blowing sand and dust. The San Diego area will be partly cloudy on Tuesday with highs 65 to 70 along the coast and 67 to 72 inland. Another late season storm is expected to move into Southern California Thursday afternoon through early Saturday morning, bringing widespread showers, mountain snow above 6,000 feet and possibly thunderstorms.